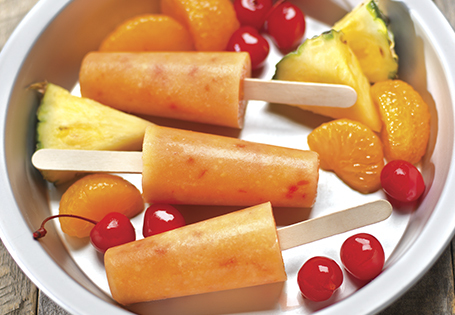 A twist on a childhood favorite that kids will love, too! In a blender or food processor, pulse pineapple, mandarin oranges and coconut flakes 3-4 times. Add maraschino cherries; pulse until small pieces remain, reserve. In a medium bowl, whisk together pudding and almond milk 2 minutes. Mixture will not thicken to pudding consistency. Add pineapple mixture and stir until well incorporated. Pour into desired mold, set aside. In a medium bowl, heat marshmallows in microwave on high, 30-45 seconds. Swirl freezer pop sticks in melted marshmallow, insert into freezer pops mold. Freeze at least 3 hours. Enjoy! *Yield may vary with size of mold.